Bring all new flavors to your specialty drink menu with this Torani chocolate mint flavoring syrup! This tempting flavor will complement your beverages without overpowering them or being too sweet, while the user-friendly bottle will be convenient for your busy baristas to use. Torani flavoring syrups are specially formulated to resist curdling in milk and to hold up well under heat, making them the perfect choice for espresso-based drinks, brewed coffee or tea, and more. Use it for frappes, iced coffees, smoothies, and even baking! Infuse your drinks and desserts with an exciting flavor that blends together the rich taste of chocolate and the refreshing cool taste of mint. It can also bring new flavors to your sweet frappes or mixed drink menu. Discover new Torani recipes for this flavoring syrup, including cash money mocha, chocolate mint steamer, thin mint milkshake, and more! Milk Shakes!!! I really love this flavor in my coffee but it is really good to use to make milk shakes. We call it Thin Mint after the Girl Scout cookies. This Torani Chocolate Mint Flavoring Syrup is super nice and unique. We use it for a special mocha drink with a minty kick at our cafe and customers love it. I love the combination of this syrup. The taste isn't over powering and goes great when mixed with water. I typically add a pump of syrup to my waters daily which helps me drink enough water throughout the day. The mint is a great touch to make water more refreshing. Thr Torani Mint Chocolate is a hit year round at our house. Number one, it's chocolate!! Second, it has just the right kick of mint making it sweet, crisp, and the perfect compliment to your morning coffee fix. So good but not as minty as I would like. The mint is kind of an aftertaste from the chocolate. Adding more doesn’t really bring it out either, just makes a sickly sweet chocolate flavored drink. It’s still good though. So I haven't had great luck with this flavor. After reading so many good reviews I'm going to spend more time playing around with this flavor. I know there's potential! A nice flavoring syrup to have in our ice cream shop. The syrup makes a really good tasting chocolate mint milkshake. I was a little hesitant at first, but glad I gave it a chance. 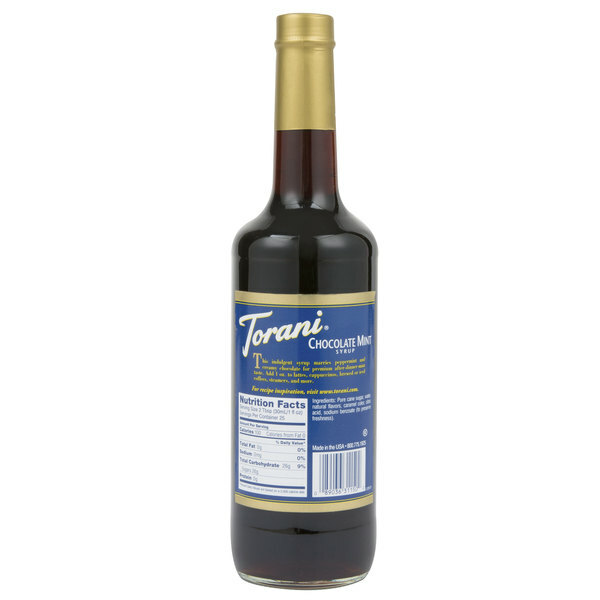 Love this Chocolate mint Torani syrup! Delicious in ,hot, iced,steamed,or blended cofee, amazing flavor comes in a 25.4 fluid ounce glass bottle all you need is one ounce in your coffee for fantastic flavor! We use the torani flavors for our shakes. The fast is just amazing. Not overpowering and doesn't require so much product for flavor. Our customers love it. 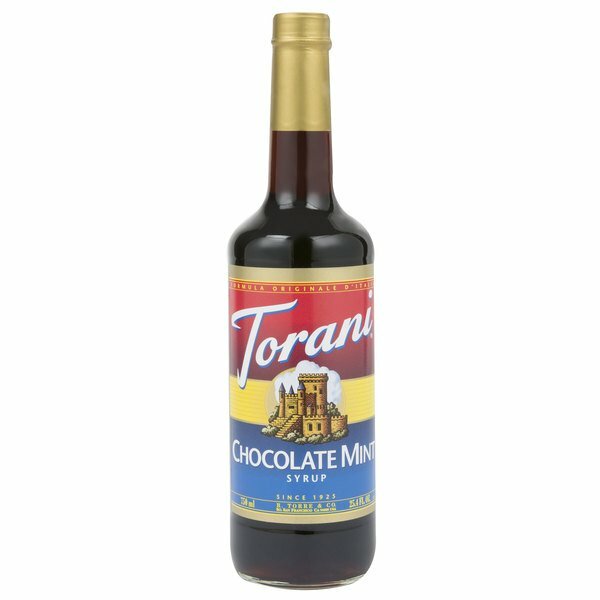 This Torani Chocolate Mint Syrup is wonderful, it goes well in everything! We use it in ice cream for a wonderful minty flavor. It's great! Very popular flavor in my store. Customers love this flavor and say it tastes just like ice cream. Definitely try with chocolate milk. It's a must have! I purchased this out of curiosity, I was greatly satisfied, it remains need me of the thin mint girl scout cookies. I just wish it came in sugar free, bc I'm a type 1 w/ insulin pump, so I only use 2 squirts, that's enough, nothing else needed PERFECT! It's great in Cocoa too! For a few pumps in your coffee, this has a lot of sugar. I was surprised to see that there is more sugar in this flavor then the caramel flavor! During the holiday season the coffee shop I worked at got a lot of orders for mint mochas. After some trial and error we decided this was our favorite syrup to use. Everyone loves it. Chocolate Mint Flavoring is one of my favorites for a cup of cappuccino. Make your espresso, add one pump of Torani Chocolate Mint Flavoring Syrup, frothing, whipped cream and top with chocolate flavoring. Toraini sauce is the best on the market. We purchase from "Webstaurant" Store they have the best prices and the quickest shipping. This is also a lot cheaper than big brands and just as good! Plus i don't pay extra for double shot's! This is a really well-balanced syrup. It has just enough chocolate and cool mint flavor. It makes a great frappe and I think I like it better than the peppermint bark sauce, which says a lot. This flavor is a perfect addition to my coffee shop for the upcoming holidays! It has a tasty balance of chocolate and mint perfect for coffee, hot cocoa, lattes and cappuccinos! This is the best chocolate mint flavoring syrup I have tried. It is an essential ingredient in my chocolate mint frappe and chocolate mint sundae recipes. my favorite torani syrup. it really tastes like an after dinner mint. however more emphasis on the chocolate than mint, so if you want minty you should combne it with peppermint. What I like about this flavor is that the mint really pops and stands out from the chocolate. The chocolate is there but you get that menthol after breath/taste which is very refreshing and makes for an interesting soda. This one is so delicious! Absolutely great taste. Like eating a cookie. I use it in my morning coffee and i cant drink it quick enough. Personally love the flavor. But a lot of mint lovers have said its not a strong enough mint flavor. Still sells as a milks shake so we continue to buy it. Torani is good quality stuff. This bottle of syrup is a great way to make chocolate mint flavored drinks. The best price you will find anywhere, and it comes in a safe package. I am very satisfied with the product. This product tastes like a thin mint cookie. It's absolutely delicious in hot chocolate!! It has become our most popular flavor yet with our students. Chocolate mint is so diverse and we are able to create many concoctions with it. We tried it at another location and it tastes just like the Girl Scouts Chocolate Mint cookies! We are excited to get it and try it out for our products. Torani syrups are great by themselves as they are not overpowering or artificial tasting. We recently added this flavor to our coffee menu. The taste is very subtle so we had to use 3 pumps of this syrup into our iced 16oz drinks vs the usual 2 pumps for the other Torani flavors. I was so sad when my last supply company stopped carrying this product so I was relieved when I found it here. Perfect flavor and so delicious. Reminds me of a chocolate mint cookie. Goes great in your morning or afternoon coffee. Flavor is not overpowering and it can be used in a variety of ways. This is the perfect combination from Torani. It is not over powering like the peppermint can be to some people. It is yummy either hot, iced, or frozen!